The Sony A8F is the A1 in a new form factor. The TV has fantastic picture quality and the sound is good too. Movie watchers and gamers alike will truly enjoy consuming content on this TV. However, Android as a UI needs a lot of refinement and the remote control needs to be redefined to be slicker taking cues from the Apple TV remote and the LG Magic remote. If you are looking to pick up an OLED in 2018 then the A8F can definitely be one to consider. Sony showed off the A8F OLED at CES 2018 and the only discernible difference between the A1 OLED and A8F was the stand. 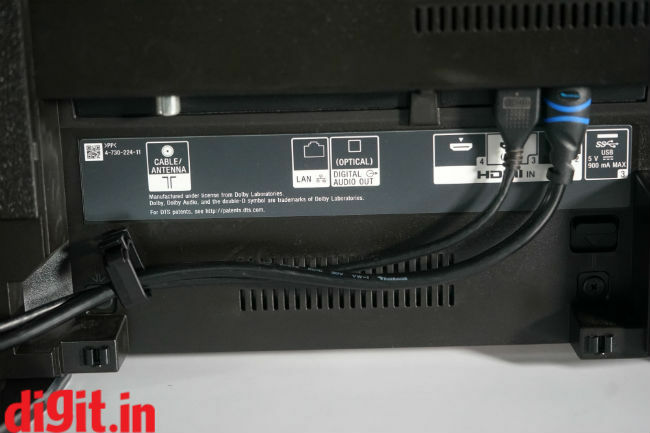 If you log on to Sony India’s website and compare the specifications of the 2 TV’s, then you will see that under the hood they are powered by Sony’s flagship technology that we saw in 2017 and literally, the only thing that has changed is the stand. Is it still a TV to consider? Read on and find out! The design of the Sony A8F oozes premium. For the duration of the review we had the TV on its table top stand. The stand has a small footprint which means that when you place it in a small table, it will hold. There is only one major drawback of putting the TV on a table stand and this may be a deal breaker for some. 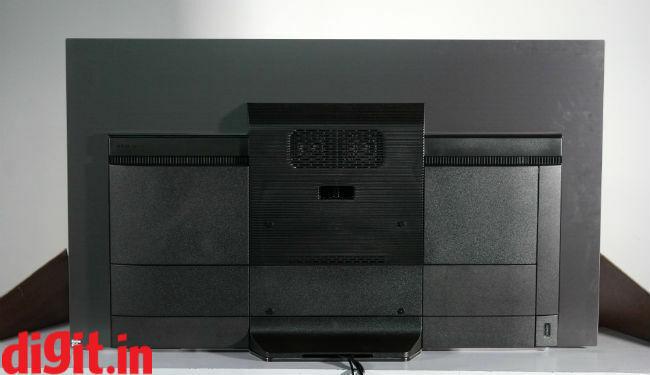 If you are one that has a soundbar or keep your Blu-ray player, gaming console or anything that stands 3-inches tall when kept on a table, you will hamper the viewing experience of the TV as there is no space between the stand and the TV. It all sits flush. If you have a tabletop where nothing but the TV will sit, then you can consider putting it on a tablet. Otherwise I recommend wall mounting the TV. Most of the connectivity options are at the back of the TV. 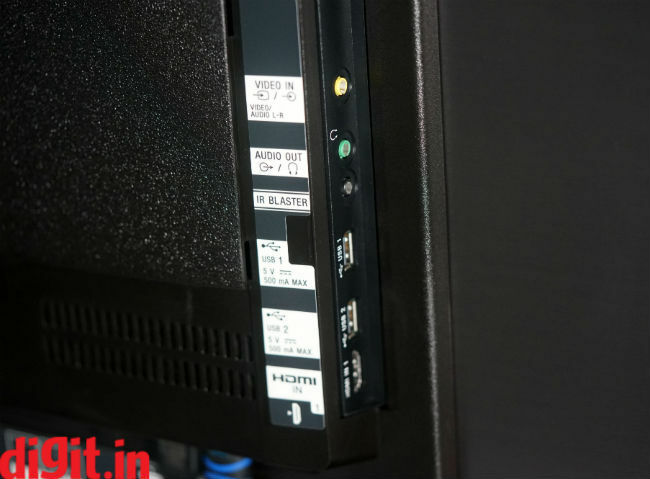 There you have the Ethernet port, RF port, 3 HDMI ports (of which port 3 is for HDMI ARC), one USB port Optical audio port and the antenna port. 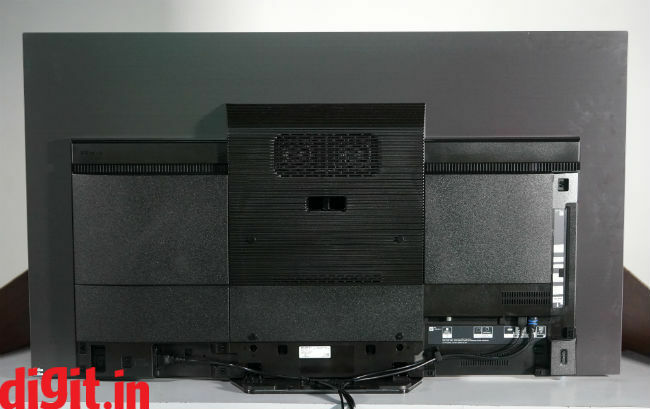 On the side you have the Composite video input, 1 HDMI input, two USB ports, IR blaster port and the headphones out. The connectivity options are plentiful. A good thing about the TV is the cable management at the back. If you are one that is finicky about the cable management, then there are panels which cover the back and help you route the cable neatly. With good cable management, all you will see on your wall/table top is the TV. 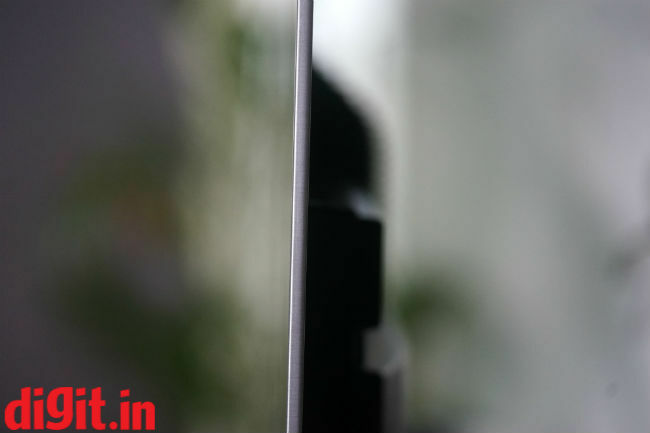 The bezels surrounding the TV are thin and the LED light at the bottom of the TV can be turned off to give you one of the most immersive viewing experience. Overall, the build quality of the TV is top-notch, and its design is slim minimalist and ideal for a home entertainment setup. Unlike the A1 OLED TV, the A8F doesn’t have the picture frame incline and I think that’s a good thing. The panel on the A8F is the same as it was on the A1 OLED TV. So, the picture performance that you are getting is the same as 2017. Now, this isn’t a bad thing at all as the performance of the A1 OLED was one of the best and continues to be so. The TV boasts of 4K resolution and supports Dolby Vision. Thanks to the Netflix app on the TV, you can enjoy all your content in glorious 4K Dolby Vision. If you have the 4K Apple TV, you have a fantastic screen to enjoy content from that device. Thanks to the OLED panel, you get some of the best colours, deepest possible blacks and the most vivid visuals we have seen on a TV. The only downside is that the panel is reflective. This isn’t a problem with the Sony TV, it’s a problem with all OLED TVs available in the market. So, if you have a light source behind you when watching the TV, you will be able to see it in the panel. Let’s break down the performance of the TV further. 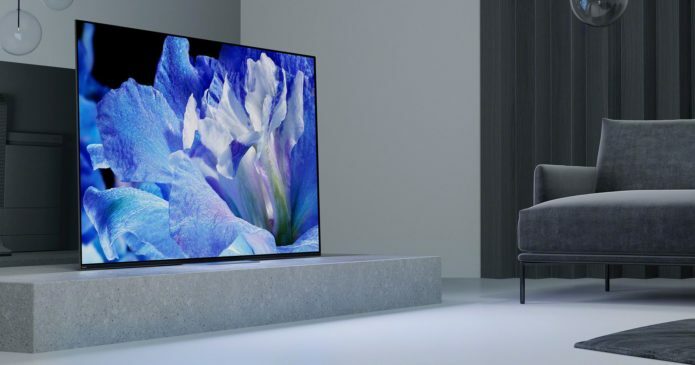 The beauty of an OLED TV is its ability to produce infinite contrast ratio, true blacks and deep colours and all of it is there in the Sony A8F. Watching Netflix through the built-in apps gave us access to Dolby Vision content and it looked breathtaking. Daredevil Season 2 episode 3 staircase fight sequences were detailed, and you could see every bit of details. The 4K HDR library on Netflix and Prime Videos in India is limited, but what is there is an absolute treat. The Grand Tour Season 1 episode 1 where you have many cars driving through the desert is a site to behold on this TV. If you are going to consume 4K HDR content from a very good source, then this TV will be an awesome experience. Since the TV supports Prime Videos and Netflix through the Android UI, we didn’t need to resort to our Xbox One X to check out 4K content on streaming services. Before we move to gaming there is one thing you should know. The HDMI 2 and 3 ports aren’t set to HDMI 2.0 full bandwidth by default. I highly recommend going into the settings and enabling them to make the most of the 4K HDR devices you will connect to the TV. This could be devices like the Apple TV 4K, Xbox One X, PS4 Pro or NVIDIA Shield. We played our standard suite of test games using a PS4 Pro and Xbox One X on the TV. These games range from Battlefield 1 to Uncharted: The Lost Legacy, God of War, Gears of War 4, Forza Horizon 3 and more. 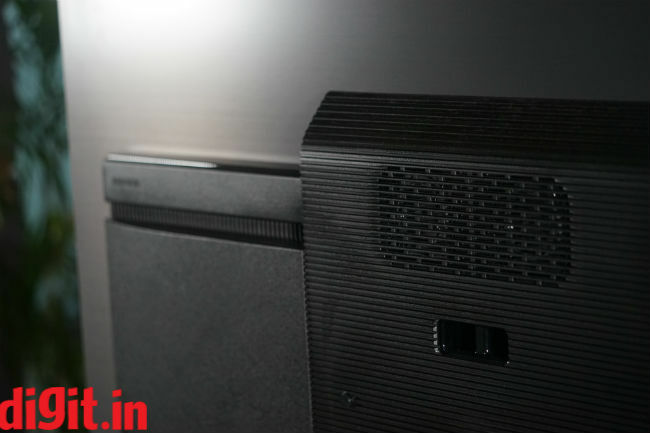 If you have access to the 4K capable consoles, then you are in for a treat. 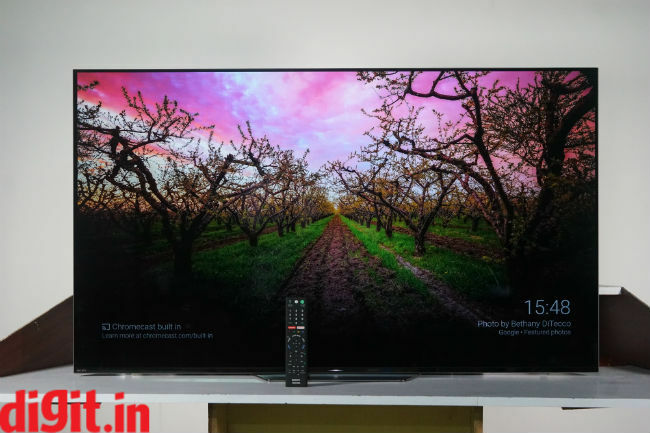 We played a lot of God of War on the Mi TV 4 and switching to the Sony A8F shows the difference between a 40k TV and a 3.4 lakh rupee TV. Don’t think the Mi TV 4 is bad. Not at all. It is just that with an OLED panel, the visual elements of the game will show you things you haven’t seen before. The same can be said for the red storm sequence in Gears 4. Speaking of sound, the Sony A8F has the same acoustic surface we saw on the A1 OLED. This makes the entire screen the speaker. Two actuators behind the TV vibrate the screen to create sound. The TV also has a subwoofer at the back for low frequencies. The audio from the TV is as good as it was on the A1. The beauty of the system is that if a character is talking on the left of the screen, then that’s where the sound will come from. It gives quite a wholistic sound experience especially when you consider that these are the built-in speakers of a TV. This effect is well pronounced when watching a movie. Alas, there is no surround experience and for that you will have to invest in a home theatre for that, but the TV does have fairly impressive stereo separation. If there is one department where the TV lacks (actually, there are two, but more on the second later) it is with the remote control. It’s the same remote control that was present with Sony’s 2016 flagships. This is 2018. 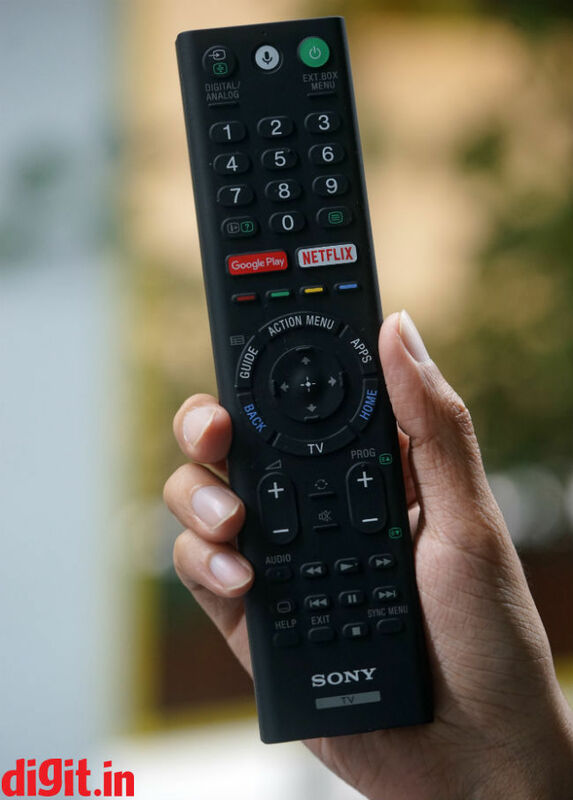 The remote is functional and gives you access to all possible inputs and shortcuts. You have dedicated playback controls that work with all streaming apps. You have a shortcut for Netflix and not any other streaming service. If you see how LG and Samsung have their motion enabled remotes, minimalistic, stylish and convenient to use, then Sony’s remote feels outdated. Its functional for sure, but it doesn’t look like something from 2018. The UI is another department where the TV needs an overhaul. Technically, this isn’t Sony’s fault, but Google’s since Sony is running on a stock Android TV UI. Boot up the home screen and you will see some of the most useless YouTube recommendations right on top. There are two separate lines for apps and the settings are right at the bottom. If you take a look at LG’s Web OS on TVs you will realize what a neat TV UI needs to look like. Another downer to the UI is that it is slow, which on a 3 lakh rupee TV is unacceptable. There are moments when I pressed the action menu button and had to wait for more than 10 seconds for the menu to appear on the screen. It’s good that the TV works on Android giving you access to a large library of apps, built-in Chromecast and the ability to sideload apps if needed. The remote control of the TV has voice recognition which works as well as the Google Assistant on the smartphones and is one of the most useful features on the TV. The Sony A8F is some exquisite old wine in a fancy new bottle i.e., the A1 in a new form factor. That isn’t to say that it’s a bad TV. It’s just that if you are looking to pick up an OLED from Sony, there’s no reason to consider this over the A1, if you already own the A1. For newcomers, the 55-inch Sony A8F is available for Rs 2,49,990 and the 65-inch variant is available at Rs 3,59,990. The A1 on on the other hand sells for Rs 3,59,990 for the 55-inch and Rs 4,59,990 for the 65-inch. What is worth considering is that Sony showed off the X1 Ultimate processor at CES 2018. The X1 Ultimate is capable of object-based processing. 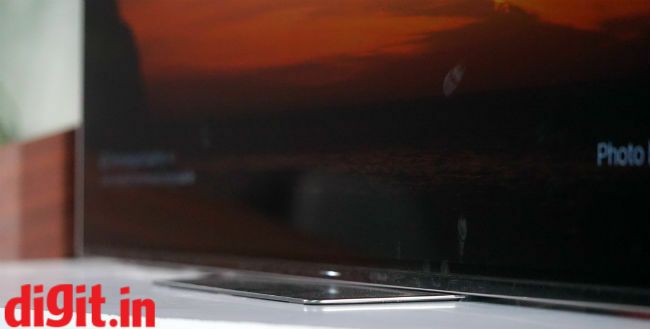 It will be very interesting to see a Sony TV powered by the X1 Ultimate. Until then, if you are looking to pick up a flagship OLED, you can definitely consider the A8F.